During the last decades of the Twentieth Century, Prince William County experienced tremendous growth due to its close proximity to Washington D.C., eventually becoming the third most populous county in the entire state of Virginia. Over the course of the late of 1980s and 1990s, Prince William County would become the site of George Mason University’s newest campus. Now (2012) in its fifteenth year, the Prince William Campus continues to be an essential component in Mason’s Distributed Campus system. During the fall of 1986, elected officials from Prince William County approached George Mason University regarding the potential establishment of an institution in the area. Mason worked with Northern Virginia Community College (NVCC) to form an exploratory committee that would study demographic shifts in the region, allowing the two schools to see whether establishing an institution was feasible. The exploratory committee returned with a full report in June 1987. The report found that Prince William County was “experiencing unprecedented growth in population and overall economic development.” George Mason’s schools of Business Administration and Information Technology were believed to offer the classes most relevant to the local population. Graduate courses in education from Mason’s College of Education and Human Services were also suggested. The committee finally recommended that Mason “establish a Center for Higher Education” at NVCC’s Manassas Campus located on Va. Rte 234, just above U.S. Rt. 66. According to the proposed plan, the first courses offered at the center would be “professional programs” in engineering, information technology, education and business. The center would serve as a model for new teaching techniques in the Twenty-first Century. George Mason University President Dr. George W. Johnson began to seriously consider installing a facility in Prince William County during the spring of 1988. In an April 1988 memo Dr. Johnson laid out his entire presentation to the Board of Visitors regarding the proposed facility. The memo listed different concepts for the Prince William County space, including ideas to create a new residential campus, a satellite campus, or simply to establish a new graduate school. In August 1988, the Prince William County Board of Supervisors began to organize an advisory committee which would submit a proposal for the project. “A Proposal for a University Presence in Prince William County,” which was made public in September 1989, was fully backed by the Board of County Supervisors, Dr. Johnson and Dr. Richard J. Ernst, the President of NVCC. It included plans for a 100 acre campus, complete with a 50,000 square foot “gateway academic building,” scheduled to be completed by Fall 1991. An additional, 150,000 square foot building was set to be completed by Fall 1993. The original idea of using NVCC’s Manassas Campus was eventually abandoned because it was not conveniently located for many residents of Prince William County. In addition, the committee strongly suggested that the Prince William facility be given its own identity from the start. The proposal also explained the different academic programs (both graduate and undergraduate) that Mason should offer at the institute, NVCC’s eventual involvement with the facility, a funding plan for the project and the sharing of academic resources with George Mason University. Mason’s Board of Visitors (BOV) was generally receptive to the Prince William plan. 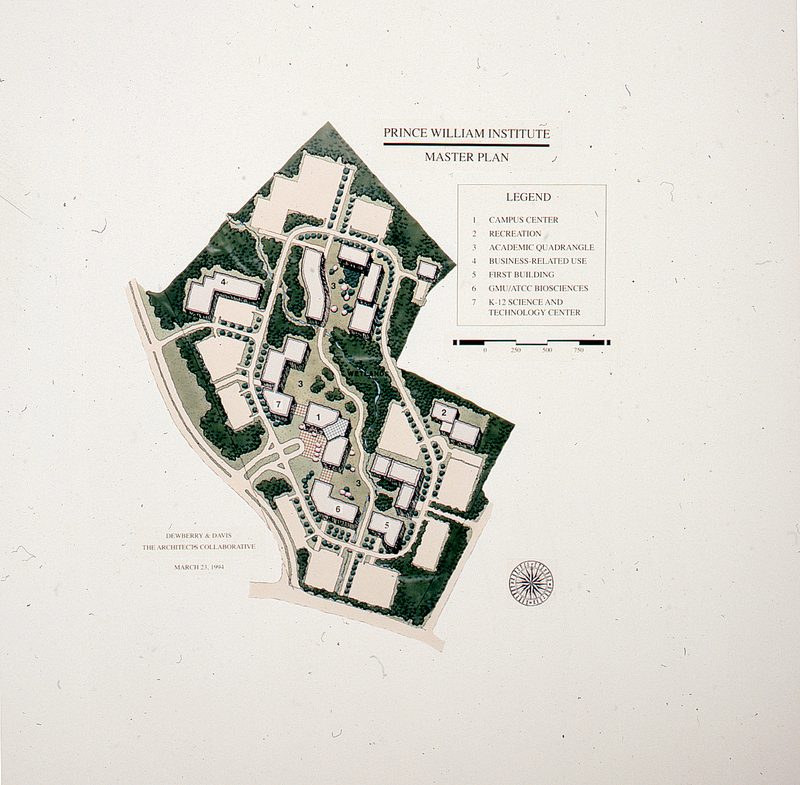 The initial idea of planning a potential Prince William Institute was proposed by Dr. Johnson at the September 1987 BOV. A majority of Board members supported the drafting of a formal proposal, although some questioned the funding required and criticized what they saw as possibly fragmenting programs by offering them at two locations. At the May 1988 BOV meeting, Dr. Johnson formally proposed constructing an institute in Prince William County. Some BOV members objected to the idea initially. They cited an uncertain development future for Prince William County, potential problems in acquiring land, possible exaggeration of public support for the project, and possible concerns from the Arlington Campus. At the time, it was unclear whether or not Prince William County would continue to grow. Additionally, its infrastructure was not in optimal condition. However, the Board voted to approve the Prince William Institute project on a 12-3 vote. Later, in a September 1989 Board of Visitors meeting, Dr. Johnson discussed how the establishment of the Prince William Institute could be the first step in expanding the University to other parts of Northern Virginia. In 1991 The Prince William Institute opened at a temporary site in a shopping center located on Sudley Road in Manassas. At the same time George Mason University, partnering with Prince William County officials and NVCC, submitted a proposal to the state that would allow for the construction of a permanent campus for the institute. While the Commonwealth debated whether or not to approve the project, classes and events were held at the Sudley Road location. An on-site library was just one of the several resources available to students at the institute. After receiving approval from the Commonwealth, Mason began organizing land acquisitions that would be home to the future campus of the Institute. By 1995, the University had acquired enough land to start building a new campus. On September 14, 1995, Dr. Johnson presided over a groundbreaking ceremony for the new location of the Prince William Institute. Various representatives from Prince William County and George Mason were given puzzle pieces which, when put together, formed a map of the new campus. The joining of the puzzle pieces symbolized the many partnerships that were needed to create the institute’s new home. Dr. Johnson retired at the end of the spring 1996 semester and was succeeded as President by Dr. Alan G. Merten. During Dr. Merten’s first month in office he was briefed on all ongoing projects, including the construction of the Prince William Institute’s permanent home. At the time, the Fairfax Campus was referred to as the Main Campus and the Arlington Campus was referred to as the Metro or Law School Campus. Merten felt that unless the Prince William Institute was formally recognized as a “campus,” it would appear inferior to Mason’s other two locations. Therefore, one of Dr. Merten’s first decisions as president was to change the new location’s name to the Prince William Campus. The Prince William Campus was dedicated on September 24, 1997, when the first building on its grounds opened. Since the campus’ opening, Prince William has constructed other academic buildings, the Hylton Performing Arts Center, the Verizon Auditorium, Bull Run Hall and and the Freedom Aquatic & Fitness Center. The campus is also home to the Edge, a popular team-building facility in the Northern Virginia area. George Mason’s third location has been widely successful, with an enrollment rising from 1,000 students in 1997 to over 2,200 students in 2010. The Prince William Campus is still growing physically, with a new addition to one of the academic buildings and student housing set to be completed in 2013. As Mason continues to thrive in the future, the Prince William Campus will be a vital part of its success. Browse items pertaining to the Prince William Campus.